This is a comprehensive, clear description of brain development with a focus on creativity, intelligence & healthy emotions; creative tools and strategies for nurturing and stimulating conditions children need to develop and thrive. Many questions are answered. How does a child's mind grow? Is our capacity for learning and creativity limited by our genetic makeup? In Magic Trees of the Mind, leading brain researcher Dr. Marian Diamond draws on decades of experience and scientific study to reveal how a child's brain physically responds to environmental influences. She describes how we can provide our children with the nurturing and stimulating conditions they need to develop and thrive. Hopson is a journalist who has written for Science News, Reader�s Digest, Cosmopolitan, and the New York Times among other publications. 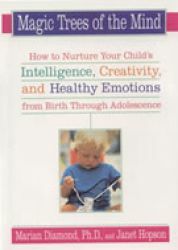 She adds anecdotes about children, discussions of social and educational implications of brain growth, and specific enrichment programs for each age group during childhood. The message of this book is quite clear: Childhood is a special, magical time when the brain is metaphorically sponge like and when learning new skills can be both fun and effortless. These authors share information in a clear, fun, and easy-to-read book that is a work of science and a practical guide for parents eager to give their children a head start in life. One of the most valued sections of this book is the listing of books and toys developmentally appropriate at different ages.